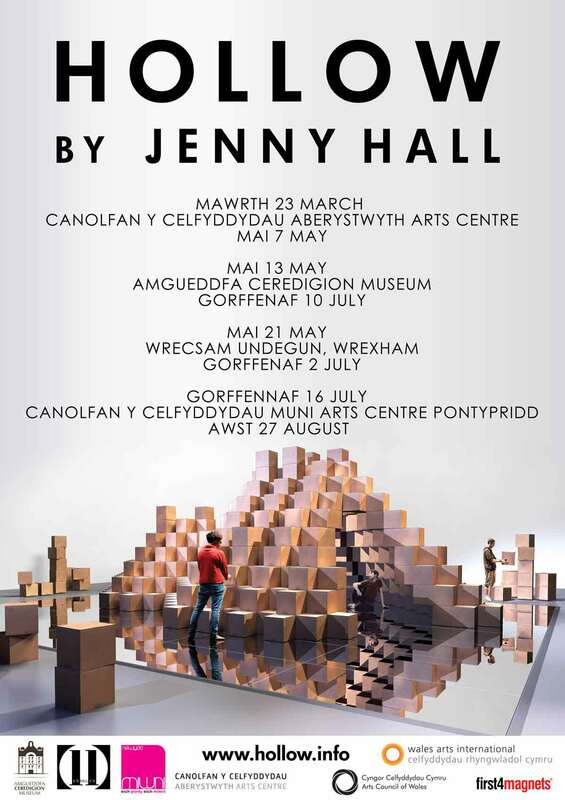 Wrexham’s creative space Undegun will be welcoming Hollow, by Machynlleth based Artist Jenny Hall, which will delve into new territory for the pop up arts centre, creating a space-within-a-space as a large architectural structure is given form by the artist. The exhibition also challenges the public to experiment with building their own structures from the blocks. Taking a copper mine as a source of inspiration, this exhibition explores the creative destruction involved in the act of construction. The mine was represented as a large hollow sculpture at the Aberystwyth Arts Centre where loose cardboard boxes represented the ‘ore’ that had been extracted from inside. As the touring exhibition also explores displacement: of an idea, of a material, Hollow has been re-imagined for Undegun in a new form. Cardboard boxes are the perfect material for expressing a thing displaced. These connect together with magnets. Jenny invited award winning Welsh architecture practice Rural Office for Architecture to create a design using her building block system for Undegun. Their exploded spherical form lends itself to the arts centre’s program of music and dance performance. Hollow will also be re-imagined when it travels to the Muni centre in Pontypridd. Constructed on a large mirrored floor, it encourages visitors to consider the relationship between the spaces we create above and below the ground. ‘Hollow’ will be on display to the public from Saturday, 21st May, and there will be a programme of events and performances during the run of the exhibition providing a chance to meet the artist and Architect Niall Maxwell of Rural office for Architecture to discuss how structures are created and how people identify with and use these spaces. Opening Hours for Undegun Art Space are Wednesday to Saturday, 12pm to 4pm.